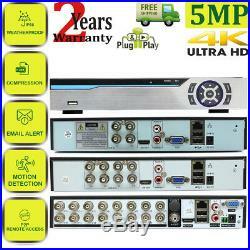 5MP 4K 1960P 1080P CCTV HD IP66 NightVision Outdoor DVR Home Security System Kit. 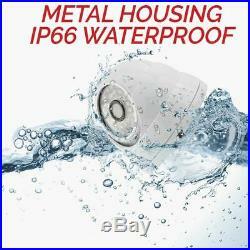 4/8CH Full HD DVR & 5MP Water-Proof Camera. GoVision surveillance system is designed to meet your both Business and H ome needs with easy installation and operation. Day or Night , you feel safe and secure. With Ultra HD security system, you are informed about what is happening at your home or business as well as watch High Quality video on your PC or smartphone at any time. It provides superb compression, in most cases more than double record times. 264 will sample up to 32 frames of video to ensure complete accuracy and quality. The ability to bring together high quality and low memory sizes allows for seamless presentations of video when transmitted. View From a TV or PC Monitor. DVR offers two types of diplay choices when viewing the captured videos: (1)HDMI connection for generating high definition video to your flat screen TV including LCD, LED TVs or monitors, and (2) VGA connection for viewing on your LCD monitor or compatible TV. 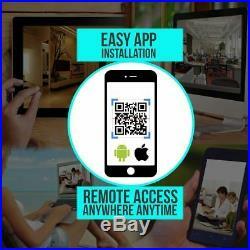 Just simply plug the device to your TV or desktop computer to enjoy the video. With the ability to see all the cameras live from anywhere anytime in the world, peace of mind is always at your fingertips. Use a smartphone, download the app, scan the QR code and start viewing a live feed of the camera. It means: (1) no need DDNS server or service, and (2) no need to set port forward or port mapping. 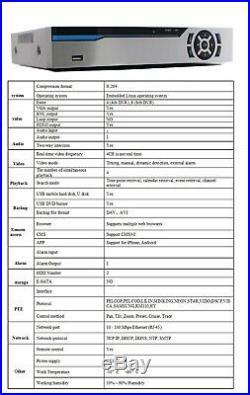 It presents you with more options of connections, it supports CVI, TVI, AHD, Analog as well as IP cameras at the same time. It gives you an opportunity to make the most of your old cameras. Being the first to know when things happen. 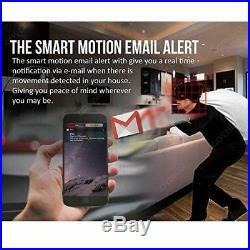 You can set motion detection zones and focus on critical area and receive motion alert from there. 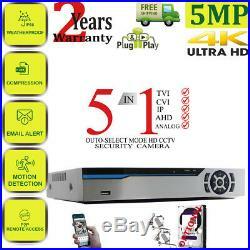 DVR provides true color high definition HD image which means every thing captured by cameras will be presented in super clarity and incredible colour. During the day, the camera switches the IR-Cut off to absorb more light and capture the true colour. It is suitable for both indoor and indoor usage. 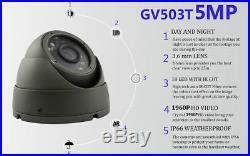 It is equipped with high 36pcs infrared LEDs for 20M night monitoring. When the ambient is dark, they are automatically activated, allowing you to see clearly in darkness. Infrared LEDs can clearly see in low visibility circumstances when human eyes cannot. 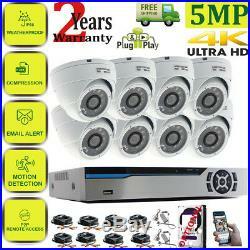 Rest assured every night when have reliable IR eye spy. High quality video has a broader perspective. It can bring every thing backs to like wheather you are recording or taking snapshots and no detail will be missed. 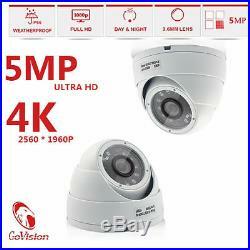 It provides you the best clear view upto 25M. What's In The Box. 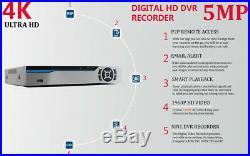 1 x 4/8 Channel 5MP Lite DVR Govision -ULTRA HD. Up to 8 X 5MP Ultra HD Cameras. Optional Upto 4TB Professional Hard Drive. 20M (65FT) Pre Made HIGH QUALITY BNC Cables. Power Supply for Cameras (DVR Has One In Its Box). 1-2 4-Way High Quality Power Splitter & Remote. 3 X screws & Plastic Wall plug, Manual NO remote. The item "5MP 4K 1960P 1080P CCTV HD IP66 NightVision Outdoor DVR Home Security System Kit" is in sale since Monday, January 7, 2019. 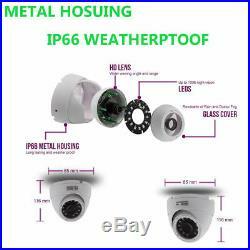 This item is in the category "Home, Furniture & DIY\Smart Home & Surveillance\Home Surveillance\Home Surveillance Parts & Accessories\Other Surveillance Parts & Accessories". The seller is "mcrlaptops" and is located in salford, Lancashire. This item can be shipped to United Kingdom, Antigua and barbuda, Austria, Belgium, Bulgaria, Croatia, Czech republic, Denmark, Estonia, Finland, France, Germany, Greece, Hungary, Ireland, Italy, Latvia, Lithuania, Luxembourg, Netherlands, Poland, Portugal, Romania, Slovakia, Slovenia, Spain, Sweden, Australia, United States, Canada, Brazil, Japan, New Zealand, China, Israel, Hong Kong, Indonesia, Mexico, Singapore, South Korea, Taiwan, Thailand, Bangladesh, Belize, Bermuda, Bolivia, Barbados, Brunei darussalam, Cayman islands, Dominica, Ecuador, Egypt, Guernsey, Gibraltar, Guadeloupe, Grenada, French guiana, Jersey, Jordan, Cambodia, Saint kitts and nevis, Saint lucia, Liechtenstein, Sri lanka, Macao, Monaco, Maldives, Montserrat, Martinique, Nicaragua, Oman, Pakistan, Peru, Paraguay, Reunion, Turks and caicos islands, Aruba, Saudi arabia, South africa, United arab emirates, Ukraine, Chile.